Ms Gladys Dalimot graduated and holding a Physiotherapy license in the Philippines. Trained and certified in aesthetic treatments for 3 months at Kaya Training Center in India (including facials using aqua jet and microdermabrasion; chemical peeling; non-surgical face-lift using micro current; laser hair removal, acne scar reduction using fractional laser and doctor led services like mesotherapy). She has worked as skin practitioner at Kaya Skin care clinic for 7 years. 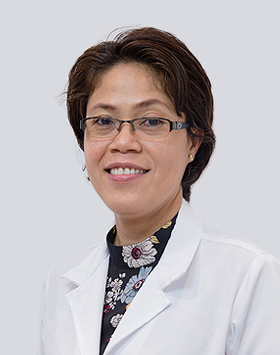 She was one of the pioneers at the clinic and was promoted and trained to be one of the senior Laser specialist in the absence of the dermatologist. Ms Gladys with long duration of experience, she has been equipped with skills and knowledge especially on laser hair removal.